Powers/Abilities: Volga was a naturally strong woman. She can transform at will within a few seconds into a heavily armored form with superhuman strength (lifting 5 tons) and durability. Her armored form added extra mass to her already stocky body. (Darkhawk#16 (fb) - BTS) - Volga was one of Professor Vonya's subjects in the Russian superhuman program. Volga joined the Perstrike Force under the leadership of Professor Vonya's brother Nikolai aka. Psi-Wolf to put a new dictator in charge after the fall of the Soviet Union. On their first mission they went to the US to kidnap defected Professor Vonya. (Darkhawk#16) - Volga joined her team in Queens, New York where they were joined by several armed terrorists under Psi-Wolf's command. Asked why they didn't arm themselves Scattershot replied that they were weapons themselves. Volga, in her human form, stood next to Siberion. Volga arrived with the Peristrike Force at Midtown High at a side entrance to the school and transformed into her armored form and punched through the wall to create an entrance for her team and their armed allies. Back in human form she watched as the armed operatives took over the school and confronted Professor Vonya, who was giving a speech about the development of superhuman powers in adolescents at the school. Scattershot and Volga entered the stage and while Scattershot told the student crowd that they were some of Vonya's bred superhumans Volga transformed into her armored form. As a demonstration of their powers Volga tossed a piano into the air, which Scattershot blew to pieces. Volga then watched Siberion attack Professor Vonya with his freezing powers. Volga had Vonya in her clutches when student Chris Powell made his way to his locker to retrieve his amulet to transform into Darkhawk. (Darkhawk#17) - Volga was holding down Professor Vonya when Scattershot received a call to inform her that the authorities were called in. Scattershot ordered to kill any hostage resisting and to wire explosives all over the school. At Scattershot's command Volga released Vonya. Scattershot then shot at Vonya several times. Called by the FBI Scattershot demanded a helicopter and a 747 for Perstrike Force's escape or else she would blow up the school. Volga held down Vonya while her team waited for the FBI to meet their demands. Darkhawk offered himself as hostage when Scattershot tried to kill his girlfriend Cheryl. Scattershot didn't care and ordered the others to attack Darkhawk. Volga hit him hard, but Darkhawk returned the favor by using his force-shield as battering ram against her. Darkhawk surrendered for a moment when Scattershot reminded him of the explosives, but when she once again threatened to kill Cheryl he attacked again. Meanwhile Professor Vonya had grabbed Scattershot's communicator and adapted it to cause a feedback to immobilize the non-powered terrorists. Avoiding Darkhawk's shots Volga reached Vonya and knocked him out after criticising his misguided idealism. Scattershot stopped Volga from killing Vonya reminding Volga that Vonya would be their ticket out of the US. Volga got hold of Darkhawk and covered his amulet to avoid any more attacks. She could barely keep her hand on the amulet to contain the energy. When Scattershot was going to shoot him Darkhawk tossed Volga over his shoulder and Scattershot hit Volga instead. Volga lost consciousness and Darkhawk knocked Scattershot out with another force-shield blast. It seemed like a victory, but then Vonya's brother Psi-Wolf arrived and took control over Darkhawk with his psi-powers. (Darkhawk#18) - Volga and her Perstrike Force teammates regained consciousness. Unable to detonate the explosive charges because the authorities had captured their armed allies and disarmed the bombs, the Peristrike instead formed a new plan to escape the school. Psi-Wolf mind-controlled Darkhawk to deliver them to authorities only to surprise attack them along with Darkhawk. Volga tossed around police cars before joining the others in their escape helicopter. They got rid of Darkhawk mid-flight before making their way to JFK International Airport. Volga stood by while Psi-Wolf organized their escape with the cooperative authoritie, who didn't want to risk the destruction of the airport. Chris Powell stole the food delivery truck to get near Peristrike Force and fled from them into a nearby shed to transform back into Darkhawk. He knocked out the surprised Volga and Scattershot immediately with a force-shield blast. Unfortunately Professor Vonya got killed by Siberion's icy powers during the fight. After he had defeated the whole Peristrike Force Darkhawk left them behind for the authorities. (Hulk: Winter Guard#1 (fb) - BTS) - Volga joined the Soviet revolutionaries Remont Six. (Hulk: Winter Guard#1) - As part of Remont Six Volga raided an AIM facility outside the Forbidden Zone. 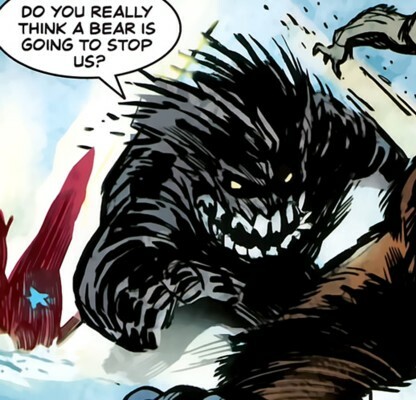 When the Winter Guard was sent in to stop them Volga and the Snow Leopards concentrated their attacks on Ursa Major, who easily knocked them all out. Comments: Created by James Asmus (writer), Jorge Molina & Ardian Syaf (pencils), Victor Olazaba & Vicente Cifuentes (inks). Though the Peristrike Force were referred to as mutants in a "next issue" box some of them were clearly not mutants. Psi-Wolf was a technology using cyborg and Siberion seemed to be a mutate. 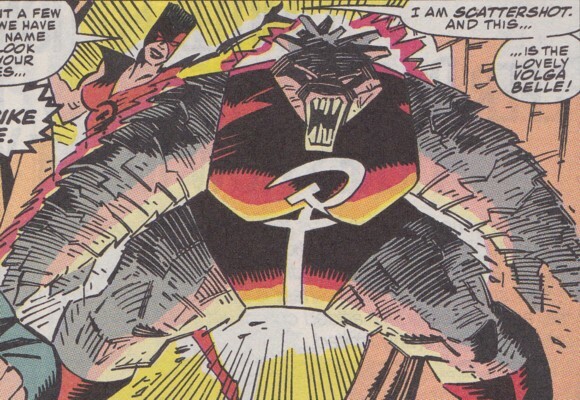 This calls into question if Volga was a mutant as well or just another mutate created by the Russian superhuman program. Though Volga's human form was seen it was always in shadows. Therefore her human form's eye and hair color can't be determined. While Volga originally dressed in a stretchy costume she wasn't as modest in her later appearance with Remont Six and decided to just go naked (in mutated form at least). Her appearance in the Winter Soldier one-shot reminded me a bit of the Critters. Volga Belle originally had a small sub-profile in Flank Mclargehuge's Peristrike Force profile.